I’m on strike again today, as I was at the beginning of December when I took the opportunity to write quite generally about the role of trade unions (here). This time I thought I would write a bit more specifically about why I am on strike. I joined Unilever in 2004, at the same time joining the final salary pension scheme – I have a leaflet in front of me now explaining the “excellent benefits”. In 2007 the company announced it was closing the final salary scheme to new employees but it said that existing members could remain in the scheme, paying higher contributions to retain their benefits, this is what I have been doing since April 2008, when the changes took effect. In April 2011 the company announced that it was intending to close the final salary scheme to current members, announcing the start of a statutory “consultation” process. I’m one of those at the softer end of the impacts: I stand to lose 13% of my pension, prior to the consultation I stood to lose 20%. This is because my already accrued benefits will be eroded by a cap as well as the new career average scheme being less generous than the current scheme, my longer serving colleagues (of which there are many), stand to lose more. To use an analogy: if you offer to cut my leg off but on consultation decide to only do so below the knee then you’ll find I’m not particularly impressed and explaining that you had “improved” your offer is frankly insulting. It turns out there are specialist “Pensions Communications” companies, Unilever is using Andrew Hodges Consulting. I’m not sure if it was their idea for Unilever to use jolly little cartoons in the post-consultation communications – but it has been the most effective recruiting sergeant for the strike action! Much has been made by Unilever of the unions “walking out” of the negotiations – this is a rather partial presentation: the unions left because the company refused to discuss any means by which the final salary scheme could be retained and would not discuss the pre-existing career average scheme in isolation with the unions. 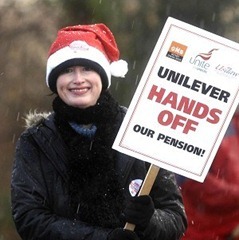 It isn’t as if Unilever is doing badly in terms of profits and executive pay, and even the pension fund is in a pretty healthy state: as of March 2011 the scheme was 91% funded, rising from 89% in March 2010 and 69% in March 2009 – it was effected by the recession but was recovering well. With the career average scheme already in place for new employees, the liabilities of the scheme would have been reduced over the coming years. Contrary to the impression companies might give life expectancy is not improving in great leaps and bounds, it is steadily increasing in a predictable manner and has been for many years. The company has made much of a “no-fly zone”, an offer to make no further changes for a period of a 2 or 3 years. I don’t expect to draw my pension for another 25 years or so – therefore I can anticipate a good few more changes before I retire. My view is that the company intends to have us on a defined contributions before too long. It highlights the problem with pension schemes in the private sector: how many companies can look forward for the 60 years that a pension requires? Until recently I was proud to be an employee of Unilever, a company that led the way in looking after its workforce as well as its consumers; a company whose vision for the future was to double the size of the business without increasing the size of its environmental impact. Today I am no longer proud to work for Unilever.